ChanceRoom.com, a new G2-powered gambling site with sports betting, poker and casino games, has launched in French and English. The site features a complete range of entertainment, all with the convenience of one account and one wallet, as well as some unique and generous VIP rewards. ChanceRoom.com players can play poker in the poker room that’s part of the largest independent European poker network, enjoy state-of-the-art casino games, and even place a bet on the ponies or footies without having to logon to separate accounts. “We’ve come up with some great ways to reward our best players,” said John Benjamin of ChanceRoom.com. “Players are automatically enrolled in our VIP Club which gives cash bonuses based on reward points earned by wagering and depositing. And, every month, we‘ll award bonus cash to the winners of our Points Race – the top point-scorers in each casino game that month. 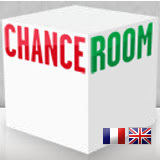 ChanceRoom.com is launching in both French and English. Customer Support staff fluent in both French and English will make sure that players are well taken care of. ChanceRoom.com is encouraging players to try their new site by offering some of the most generous deposit bonuses available anywhere. Casino players can receive up to 1200€ and poker players get a 200% bonus (up to 1000€). The sportsbook offers a 25€ First Bet Refund.